Early Spring 2017 - Upcoming Events! The recent spell of warm weather in mid/late February has left New England with a feeling of spring in the air. While it's far too early to start fertilizing (I heard Lowe's already has Scott's Step #1 on display), the time is right to plan for the 2017 organic lawn care season. If you've ever wondered what organic lawn care is all about, or if the drought conditions did a number on your grass last year, or even if you just want to discuss lawn maintenance- then I invite you to come to one of my upcoming talks. Tuesday March 7th, from 6:30-8 pm, the Pembroke library will be hosting Jack Conway Realtor's "Go Green At Home" series. I will be presenting a talk on organic lawn care and maintaining your lawn through periods of summer drought. Todd Breitenstein from the Grateful Garden in Hanover will also be at this event. Todd is very knowledgeable in the field of organic vegetable growing so if you get a chance to speak with him I encourage you to do so. Saturday April 1st, the North & South Rivers Watershed Association will be putting on their annual Gardening Green Expo, hosted by Kennedy's Country Gardens in Scituate. The theme this year will be gardening in times of drought. I will have an exhibitor's table set up and I will be presenting a talk as well. This event is a fun kickoff to the gardening season. More info to come! The days are getting longer, the soil temps are increasing and the landscape is waking up. I recently presented a talk about the basics of organic lawn care at the Hingham Library on Saturday March 19. The event had a great turnout with loads of good lawn questions and discussion afterward. It is great to see more and more people paying attention to the harmful effects of chemical pesticides and nutrient pollution in our waterways. If you are interested in learning more about organic land & lawn care, come see me at one of these upcoming events! Stop by and visit me at this great Scituate event and immerse yourself in sustainable gardening for a while. This event is sure to get you fired up for the growing season. I will have a table in the exhibitor's greenhouse where my fantastic rack cards will be there for the taking. Also on display will be my snazzy new sign. Thanks to my marketing (wo)manager Karen for putting those together! -LAST but not least, I will be presenting lawn maintenance tips and techniques for the homeowner. These are cheap and easy things you can do yourself to give your lawn the best advantage possible. Organic Lawn Care - Spring 2016! The ground may be covered with snow at the moment, but preparations for the 2016 organic land care season are well underway. 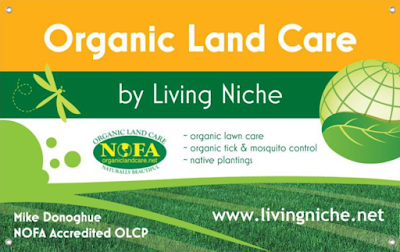 I am excited to offer a complete organic lawn care program. Conventional lawn care is a product based approach but a true organic lawn care program is all about building soil health. Please see the Organic Lawn Care page for more information, and don't hesitate to contact me with further questions!